How unusual is this car? Unusual enough that until tonight I had completely forgotten that Audi even offered a 2 door version of the 4000. The 4000, known as the 80 to most of the world, was introduced to the US in 1980. 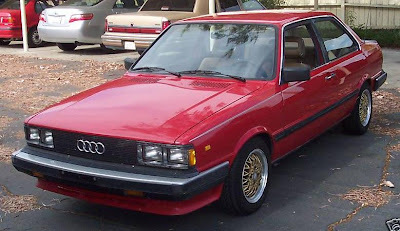 It was the replacement for the Audi Fox (which was also known as the Audi 80 to most of the world). The body for the 80 / 4000 was designed by Giorgetto Giugiaro. Audi went through some serious growing pains in this country. The 100LS was a reliability nightmare and the Fox, while slightly more reliable, was nothing special. With the 4000 / 5000 series, Audi started to gain some respect... Then they were hit with the whole unintended acceleration thing. Newer Audis are every bit as good as the cars coming from BMW and Mercedes, but the older ones are just not around. While it sometimes seems like every BMW and Mercedes ever sent to this country finds its way to eBay or Craigslist at some point, you see very few Audis. I just did a quick eBay search for 1970 - 1990 BMWs and found 101 available. There are 303 Mercedes-Benz of the same vintage available. The same search for Audi resulted in just 5 listings. The Audi 4000 being offered on eBay appears to be in very good condition. The paint looks like it's new, and that can often be a sign of rust repair - older Audis did rust - but, this is a California car, so if there was rust it was probably minimal. The interior looks spectacular as does the engine bay. I'm not a fan of gold wheels (or gold anything on a car), but the BBS wheels are period correct and don't look half bad. The 4000 came with a number of different engines and this one has the 1.8 liter 4. The engine is essentially a VW GTI engine. The car has 218,000 miles on it, but the engine is listed as low mileage. The seller doesn't say whether it was rebuilt or replaced with a used one. This Audi is FWD and has a 5 speed manual transmission. With the exception of the UR-Quattro, older Audis will never be worth any real money. Buy this car to drive it and enjoy it. 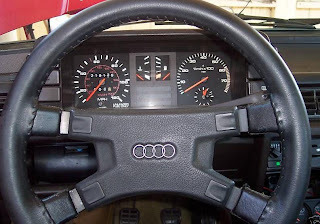 Click here to see the eBay listing for this 1984 Audi 4000. I owned an all black one of these for several years. Bought in Honolulu, driven there for a year or 2 then driven from LA to Austin on old highways, off the interstate. I sold it after a year in Austin and have regretted the sale for 20 years. I've owned Audis, Fiats, Mini's, VW's,& Renaults but this was the best ever.